The worst part about football or basketball is that the game deciding moment may not involve the best player; the worst part about a classroom is that the student or best response may be sitting quietly on the sidelines. Why? Time is the enemy of so much of what we want to do. 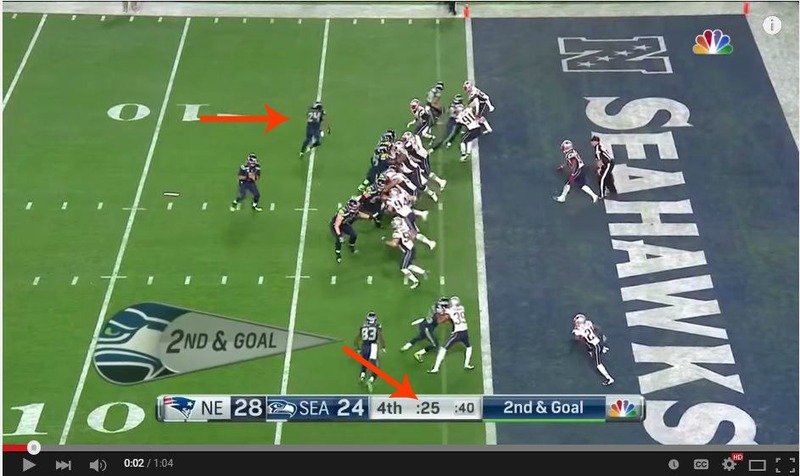 If the Seahawks had more time, they would have been more likely to run the ball. In school and at home the pressure of time keeps up from doing everything we want. Especially when we want students to ask questions. I remember my student teacher advisor talking to me about wait time. I’d ask students if they had any questions and then I’d rush to fill the awkward silence with the first hand that shot in the air. Worse yet, I’d answer my own question. So I learned to give students time, more than I felt comfortable with. Yet students still weren’t asking enough questions. Baseball is the antithesis of most sports when it comes to time. There are more games. The games are longer. Player development takes longer. Everyone gets their three outs, everyone in the starting lineup gets their turn at bat. Everyone gets their turn at bat. No matter how long it takes, everyone gets to put their imprint on the results of the game. This leisurely pace leads to an interesting place. A performance white space or Ma where time is gifted to the participants. Wondering and questioning are not only given time, they are an encouraged part of the process. Let’s use Angel’s pitcher Hector Santiago as an example. Did it work? Well if you consider being selected to your first All-Star game a success then, yeah it worked. I’ve been haunted by my own questions ever since my student teaching experience. Why aren’t students asking questions? Unfortunately, that wasn’t the right question. Unfortunately, I didn’t have the right tool to ask the right questions, to find the essential question. That tool was in my tool box, I just didn’t know it yet. A few years ago my friend Chris Long started tell me about this book Make Just One Change written by Dan Rothstein and Luz Santana. Chris seemed so enamored of it that I told my wife about it, and she bought it for me for Christmas. (Thanks) When Chris is excited about something, I’m all ears. Luckily for me, Chris Long demonstrated the tool I was missing: the Question Formulation Technique (QFT), during a staff development day before the 2014 school year. I worked with Sean Ziebarth and fellow ELA teacher Joey Barro. In just five minutes we had created seventeen questions. Many of these questions are great topics to explore. Instead of an administrator or consultant “guiding” our inquiry with a question or slide deck, we were finding our own space within the topic. Imagine how many questions our staff of 175+ came up with in just five minutes. What’s funny (or sad) is that even though I LOVE questions, there are times I don’t ask questions. When? Well at the end of meetings is just one example. At the end of meetings I literally sit on my hands so I’m not “that guy” who makes the meeting go long with another question. And that’s the problem with meetings, classes etc…. we ask questions at the wrong time. Just before a transition, just before releasing students to work in groups, just before we start up a movie, just before the end, when we are all looking out the door. Wonderful video on how everyone is a creator and how everyone is scared in the act of creating. But I had a question focus of my own: Time and the question I came up with was “how can I fit the QFT into the core curriculum?” This question is important because there is an ugly truth that principals, school change agents, TOSAs, innovators, consultants all fail to address. Read the book, hopefully deeply read, not just skim. Make connections, hopefully personal connections. Create something and share it beyond the four walls of our classroom. By the way you will notice I didn’t list discuss the book. Discussion is just one technique for getting through most, if not all of those objectives, it’s not a task, it’s a technique. So my goal this year was to come up with new active reading strategies that would meet all of the five goals. My first active reading strategy would be the Essential Question Project (man that name stinks, feel free to leave suggestions below) Before I tell you what we did, let’s just go over the essentials of the Question Formulation Technique. Create a question focus: it can be a statement, a video, a photo, a song, a skit, an object. Write down as many questions as you can for as long as you can. Don’t worry if they are “good” questions. Change some of the types of questions. Do something with those questions. Now that is a SUPER brief explanation and if you try this with your class based on that, you are going to run into problems. I really recommend buying Make Just One Change and sitting down with it before implementing this process. Since I let go of a study guide packet or a final test, each “assessment” or creation looked SO different. Two students answered their essential question “Who can you trust?” by performing a scene from the play The Craving by Don Zolidis. It was amazing. I still kick myself for not recording it. A student wrote a blog post answering the question “Why do people hurt themselves?” This was at the beginning of the year before my students became blogging pros and yet it was a great read, because the student was completely invested in his self-selected question which came from his reading of Oedipus. So it was all very fun and engaging, but I still had questions. So I asked my students some reflection questions on the project and process. What is the key to finding a good/useful question focus? Finding a focus that is relevant to everyone. Something that means a lot to me. Incorporate ideas outside of the book. Knowing about the world and how it relates to us. Finding something that stands out. In order to find a good question focus you must first summarize the material, find the topic and then how it relates to our life. What makes a question focus more likely to spur questions? When it is about something that moves us beyond the book or material at hand. When a question focus is longer and has more details then it has more spaces for you to insert questions. Find a deep question, like one that deals with the gray areas of life. If you are curious about the topic or have experience with the topic. How do you know a question is an essential question? How do you know it’s a question worth answering? How did you pick which question to answer? The deep questions are the ones worth answering. If it’s open ended or creative. It needs to involve a passion or emotion. What did you LIKE about creating your own questions? I was able to ask questions that were important to me so then I wanted to find the answers. I liked doing this because it made me relate the material to my life instead of just reading and summarizing like an outline. I was able to reflect on what I would do in these situation. This helped me understand the book more. This activity made me think more critically. At the end of this activity I learned more about myself and the book than if I had done a traditional activity. I liked it because I had to re-read sections. We liked it because it allowed us to learn more about life outside of school and to relate our lives to the book. When I read a book I don’t really think or have an opinion, I just read it. I just want to read and enjoy the book. The book was a bit boring, maybe this would be easier with a better book. I didn’t like it because I had to re-read sections. Of course, having read Make Just One Change I was sadly familiar with some of the reasons as to why this process felt strange and unnatural in school. Did you notice that the title of my blog wasn’t “How To Create Space For Questions In Your Classroom?” Starting a blog title with “How To” or using “a list” is one of the oldest tricks in the blog sphere to drive clicks to your article. But I didn’t want the title to be a question. I wanted the title to be a question focus and for YOU to create your own questions around “Creating Space For Questions.” Feel free to put those questions in the comment below. I’ve been thinking about creating learning “spaces” for a while now. We ran a #CAedchat on the topic of White Space aka Negative Space aka Ma in learning and you can read the questions and resources or even view the archive of the chat. I’ve even toyed with having a conference designed around creating space for questions that are generated the day of, rather than pre-conceived sessions or conference topics. If you want to know more about the QFT technique and other ways that Sean Ziebarth and I allow students to ask their own questions you might want to watch this video of a presentation we made at the CUE conference in the spring of 2015. The Question Formulation Technique is more than about transforming classrooms. It’s a technique used in hospitals to give patients and their families agency, it’s a tool to give anyone who lacks a consistent voice or who feels left out of a system an opportunity to become a part of a positive and productive process. It would be so powerful to use with your teachers, your parents, your community. Not at the end of the meeting, but at the beginning. A place of priority. A space where everyone can have their at-bat and take a swing at something coming their way. For those of you ELA teachers who want the nitty gritty. My students read Oedipus Rex, Oedipus at Colonus, and Antigone. I actually love reading Oedipus at Colonus because it was Sophocles last play and it was his final message to the Athens. There is a nice piece about the power of love and we get to understand Antigone more fully. I asked the students to write down their Question Focus for each Act and to center it in a piece of the text. They needed to quote that piece of text and explain the connection to the Question Focus. Then I asked them to simply write down questions that came up as a result of the QF. I was satisfied if they came up with at least five questions and happy if they came up with ten or more. At the end of each play they got together in a group and shared their QF and some of their questions. The result of this is that some students worked in smaller groups on their final project. After our final discussion students turned in their QF and questions. Oh yeah, I made them hand-write all of their QF and questions, often giving them time in class to do it. I walked around the room and checked on progress. I did this to cut down on copy and pasting of QFs and questions. There is so much material here to work with and I appreciate the time and effort you’ve invested in laying out as much of the background and process as possible. You’ve made me want to think more about how I can do this in the unlikely space of a 30-40 min. PE class. Student Questions in Ed are vastly underrated. We seem comfortable with ignoring the “quest” in question, which is a shame. Thanks for reminding us what we’re here for. I could see just a video of different people struggling to do a push-up, or different sports that we don’t play in the US, or a video of kids having fun just running around would make great Question Focus examples in PE. Heck just the title of the class makes a great QF. Please share your attempt with me, I love to see where these ideas go. “Get rid of something we had previously found valuable.” I really appreciate this thought. I’ve made some choices lately that are rooted in this idea – often we continue moving forward firmly on the rails laid out before us (by others, by us) – but we don’t question the rails; after all, the rails are the rails, they’re hammered down into the ground, THEY guide the way! What if we tear up the rails and put them down in a new way. What if our chosen path forward doesn’t involve rails? How will others respond when they see me moving forward not on rails? How will I respond to them? Great metaphor. Thanks for sharing this. One more comment. I usually do everything my students do and then share the results so they can use it as a guide and so that I can better judge how long the assignment will take and where the sticking points are. I decided not to share my questions and Question Focus with them so that they wouldn’t be tempted or swayed in their own struggle to make sense of the book. I did do it with the first Act or two, but after that they were on their own. I’m not sure how I feel about this approach, so I may modify this so that it’s more of a shared journey. Any suggestions are appreciated. Really enjoyed reading this. Thank you for talking about what we remove form curriculum as being just as important as what we add. John Hunter, creator of the World Peace Game, also talks about the importance of clearing space for learning. He maintains that when we fill the space with all of the things we want students to learn, they have no space to work out things on their own. I over simplify, but you are making a point here that resonates deeply with my own journey as a teacher. In trying to keep learning relevant in my classroom, I’m learning to let go, trust students capacity to figure things out and understand I don’t need to “know” before I clear space for all of us to learn. The QFT was a game changer for my students. For anyone remotely considering a go at the QFT, do it! It’s incredibly powerful. You know when students say things that make you go “Huh. I never thought of that”? Well, the QFT will get you thinking that all the time! And if you’re thinking “Huh”, can you imagine how often your students are thinking “Huh”? Great post. Do your students a solid and QFT it this year. I urge Ed tech leaders to include library services! The model school library standards addresses question formulation specifically in grades K-12. (CA MSLS 2.1) This is the heart of information literacy, librarianship, and the integration of the student’s own personal interest. Please see fall OnCUE Journal 2015.